Train K7094/K7095 doesn’t take the most direct route between Haila’er and Harbin but runs north from Yakeshi to Yitulihe then east to Jiagedaqi and south through Nenjiang to Qiqiha’er before rejoining the main line. This turns a 10 hour, 680km journey into a 25 hour 1160km ordeal. Bet there aren’t many passengers who go the whole way. 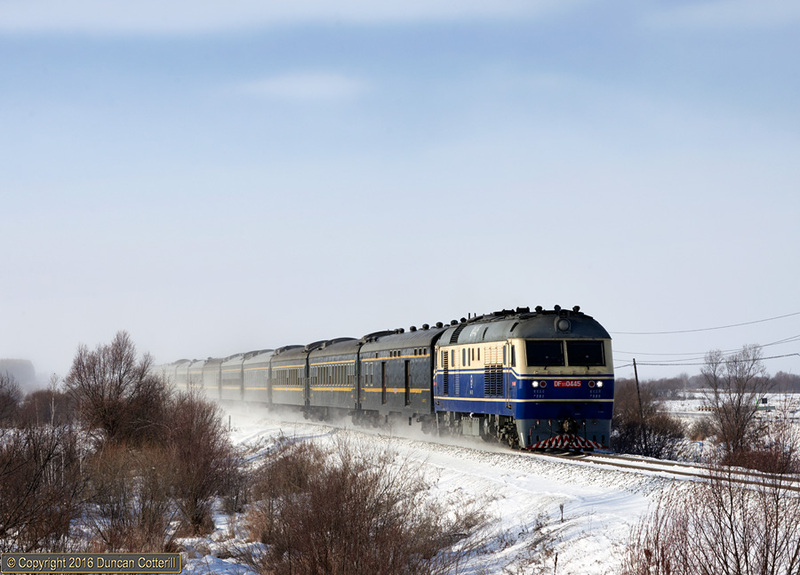 Harbin allocated DF11 0445 approached Meitian with K7094/ K7095 just after 10:00 on the morning of 20 November 2016, stirring up the snow. It would be 08:30 the following morning before the train reached its destination.